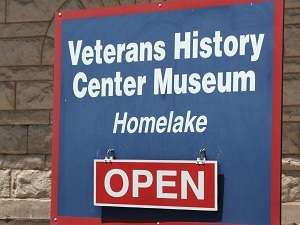 The Veterans Museum is located at the Colorado State Veterans Center at Homelake. To get to the Museum follow Sherman Avenue east out of Monte Vista. The Museum is on the north side of the road. Donations are accepted for admission. The hours are Monday, Thursday, Friday from 10:00 am – 12:00 noon and 1:00 pm - 3:00 pm and Tuesday, Wednesday from 9:30 am – 12:00 noon and 1:00 pm – 3:30 pm. Upon my (Debbie) arrival at the Veterans Museum, I was given the tour by my dear friend, Sue. I quickly learned that the Museum was not always located in this building. 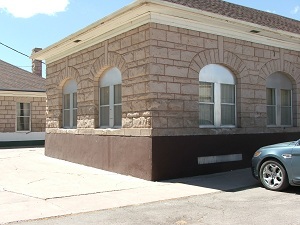 It was originally in what is today the Administration Office. It was moved to its present location after outgrowing its old building. The future plans for the Veterans Museum is to move it to the old Administration Office. The old Administration Office is a two-story building which is slowly being renovated to eventually accommodate the Museum. Money and time are issues involved in the move. The Colorado State Veterans Center Homelake is the oldest veterans center in the state of Colorado. It was established in 1889 to care for Civil War Veterans. The first buildings were built between 1889 and 1891. The hospital and the barracks were torn down in 1960. 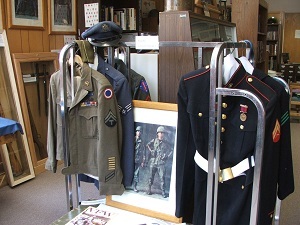 The Museum has displays pertaining to military and veterans artifacts. These include Civil War memorabilia, San Luis Valley Veterans of the Spanish-American War, Korean War, WWI, and WWII. I learned that the Blue Star Mothers of American was actually formed on March 8, 1942 when 600 mothers organized the Blue Star organization. I have friends who belong to the Blue Star Mothers of America in respect to their child(ren) who are active in the military now. There is a picture of the Last Squad Club dated February 4, 1942, part of the WWII Veterans. An interesting display was that of the WASPS (Women’s Air Force Service Pilots). Make sure to take the time to read about Mary Kinney who died at 90 years old at Homelake. What an inspirational story about the part women played in the military and a wonderful tribute to Mrs. Kinney. 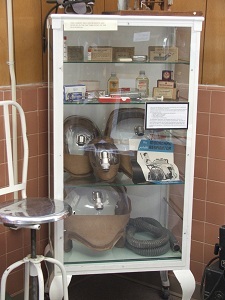 There is a great exhibit area with instruments and supplies used in a doctor’s office from an old hospital. 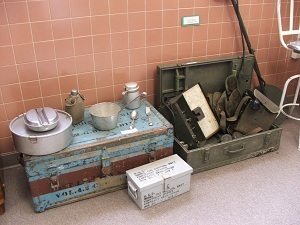 There is an old x-ray machine, antique metal detector, field telephone, German helmets, military clothing, antique canteen, trunk, cooking utensils, a drum from the Civil War, and many other displays. As you can tell there is a lot to see in this Museum. I highly suggest you take time to visit the Veterans Museum as a way to honor and respect the past and present military who serve and protect this great country we live in.